SOUR POWER® PINK LEMONADE BELTS ARE NOW AVAILABLE IN TUBS! SOUR POWER® Pink Lemonade Belts in Tubs have arrived! A popular flavor already offered in Bulk Belts and Straw Packages, Pink Lemonade Belts are now available in 150 ct. Belts in Tubs. 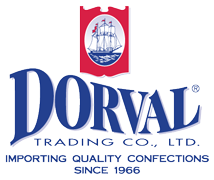 Dorval Trading Co., Ltd. is very excited to be adding another flavor to its already popular 150 ct. SOUR POWER® Belts in Tubs (unwrapped) category. The Pink Lemonade belts join our other exciting flavors of Strawberry, Green Apple, Watermelon, Berry/Blue and 4-color Sour Power Quattro® belts. These belts are packed 150 unwrapped belts per tub and 12 tubs per case! The launching of our highly successful new flavor Pink Lemonade, now available in Belts in Tubs, is thrilling to us as we expand the ever popular SOUR POWER® Brand. This great product is available for shipment right now! Dorval Trading Co., Ltd., is an importer of an extensive range of high-quality confectionery products from major manufacturers around the world. Dorval has grown into a significant presence in the confectionery and specialty distribution arena.